It might be long gone but the glory of the Roman Empire still lives on in Rome. 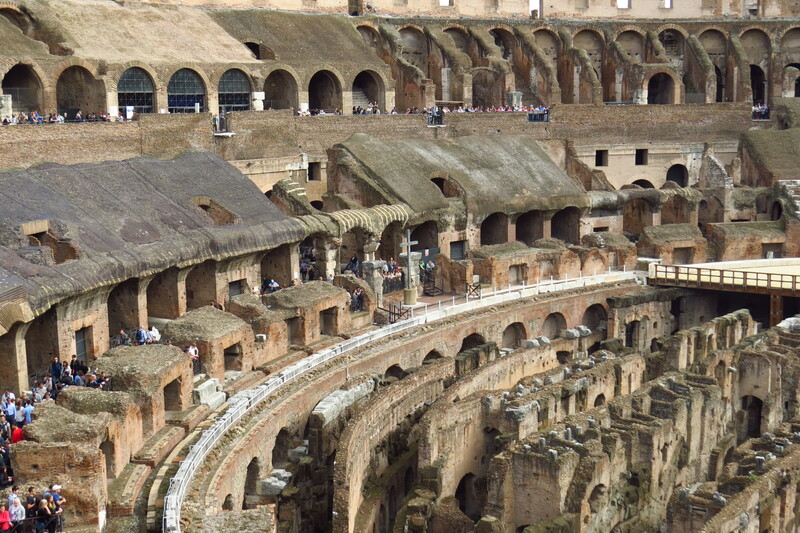 Mostly in the form of the city’s most famous attraction, the mighty Colosseum, where gladiators and wild animals fought each other, and the Forum, where Roman senators and leaders used to meet to run their empire, but also numerous other buildings, ruins, castle, and even a 1.5 km road that is still very much in use. 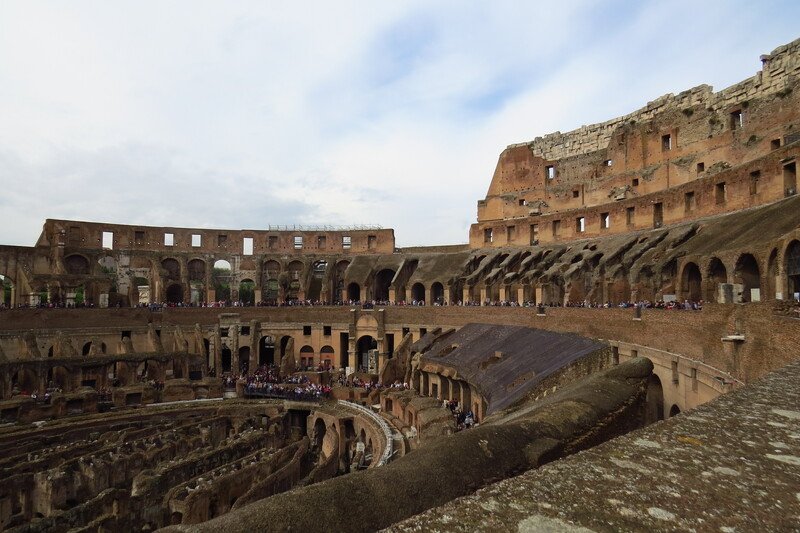 I found the Colosseum impressive as it was built over 2,000 years ago as the Roman equivalent of today’s football stadiums but it was still quite as large as modern stadiums. 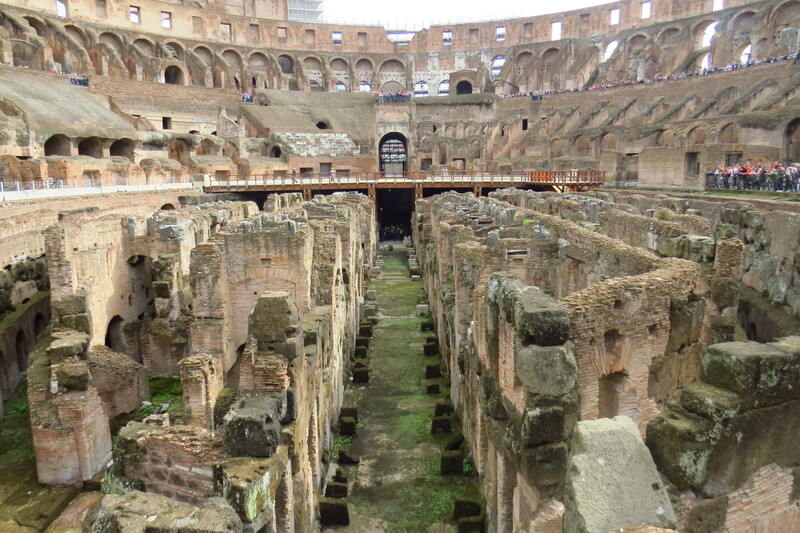 Obviously, it’s been extensively renovated but it was good to see that the Colosseum is very much still intact. 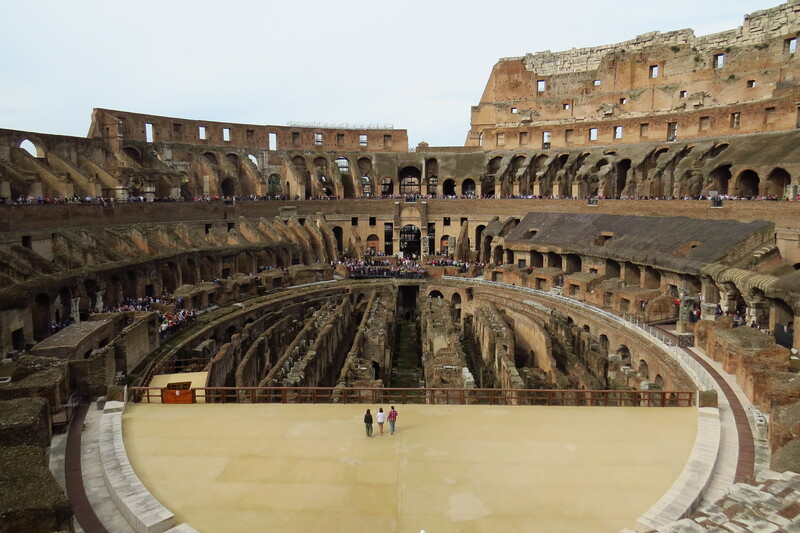 Once inside, you get to walk around the inner bowels and the spectator stands where you can imagine watching gladiators fighting in front of tens of thousands of bloodcrazed Romans. 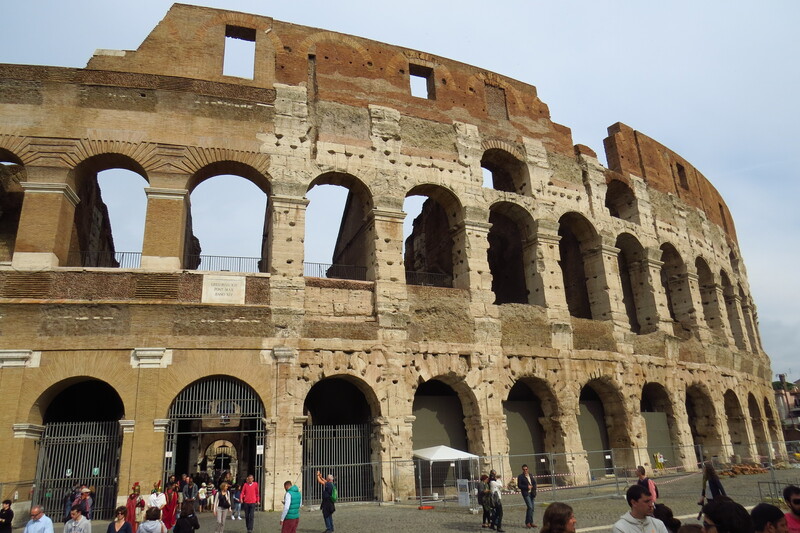 The Colosseum is next to the Forum, which was the centerpiece of ancient Rome where the government used to meet, but which now exists as an impressive collection of ruins including towering columns, halls, and statues. 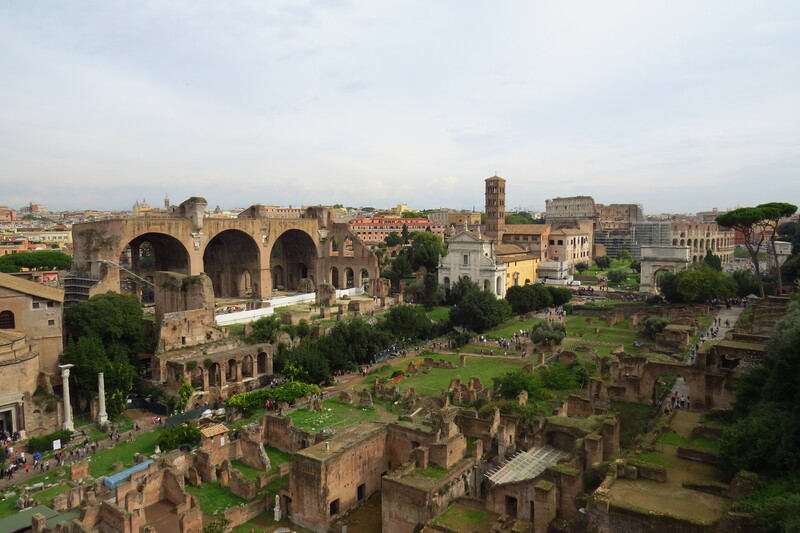 Next to the Forum is the Palatine Hill, where many rich Romans used to reside. After you leave the Forum, one can walk straight up the Capitoline Hill to the Piazza del Campidoglio, designed by the great Michaelangelo. 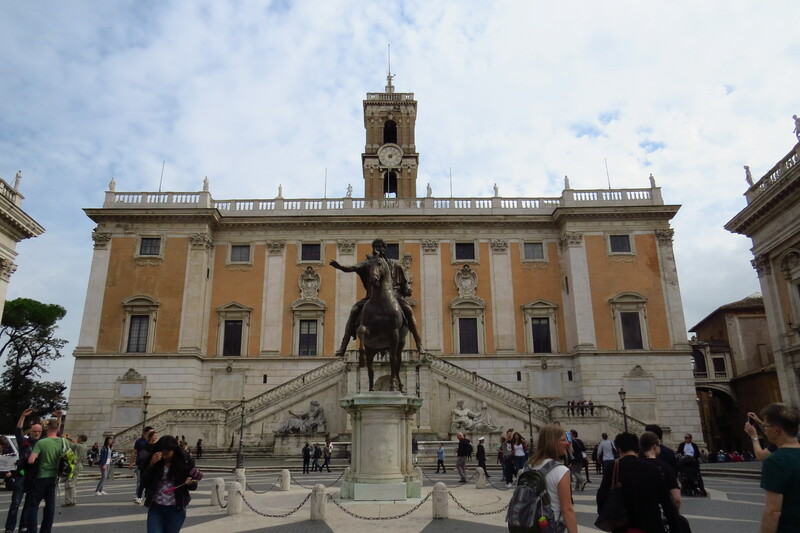 A statue of Marcus Aurelius (one of Rome’s greatest emperors and who was in the movie Gladiator) mounted on a horse stands in the middle of a piazza surrounded by three exquisite buildings which house the Capitoline Museum. 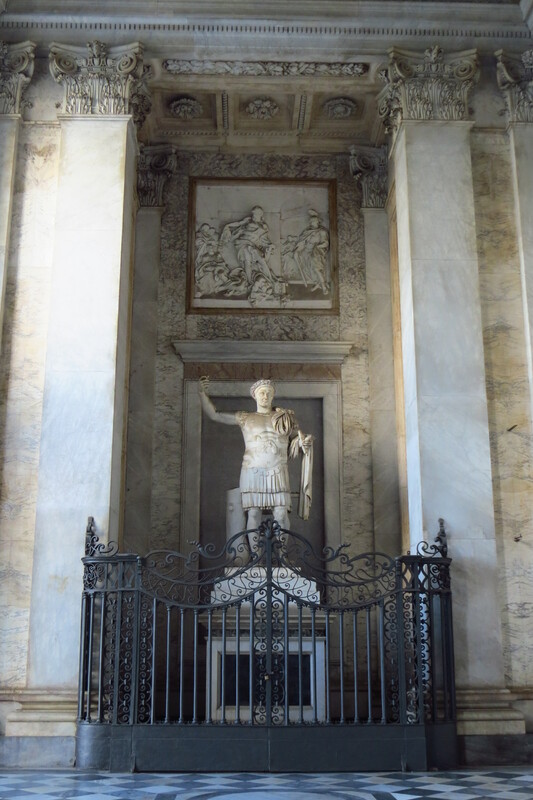 My next stop was to fast forward over a thousand years in history to visit a giant hall that pays tribute to the first king of modern Italy, Vittorio Emmanuelle II, who ruled a unified Italy from 1861 to 1878. This massive all-white building fronted by columns looks impressive though apparently some locals feel it looks very out of place and is too extravagant. From the Vittorio Emmanuelle memorial, one can walk across the roundabout to the Via del Corso, a 1.5 km road which the Romans built. On either side of this straight shopping street are elegant low-rise government and historical buildings, stores, and many lanes. 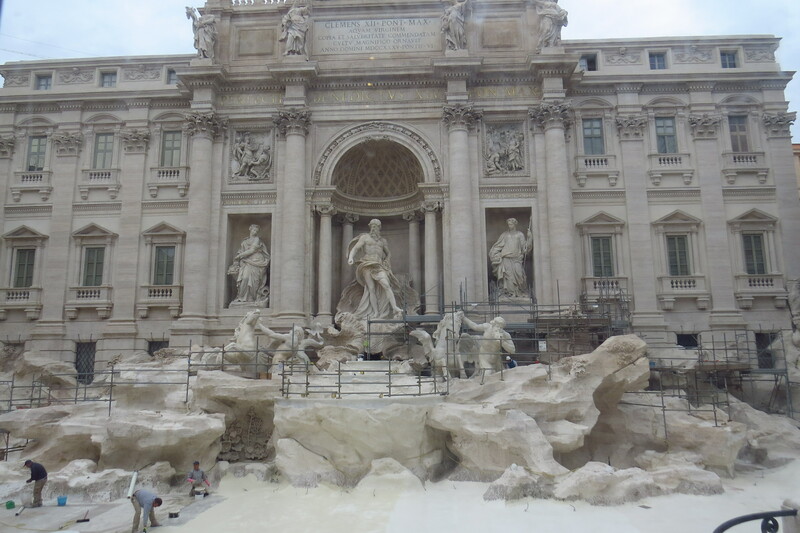 To the east of the Via del Corso are historical structures like the Spanish Steps and Trevi Fountain. 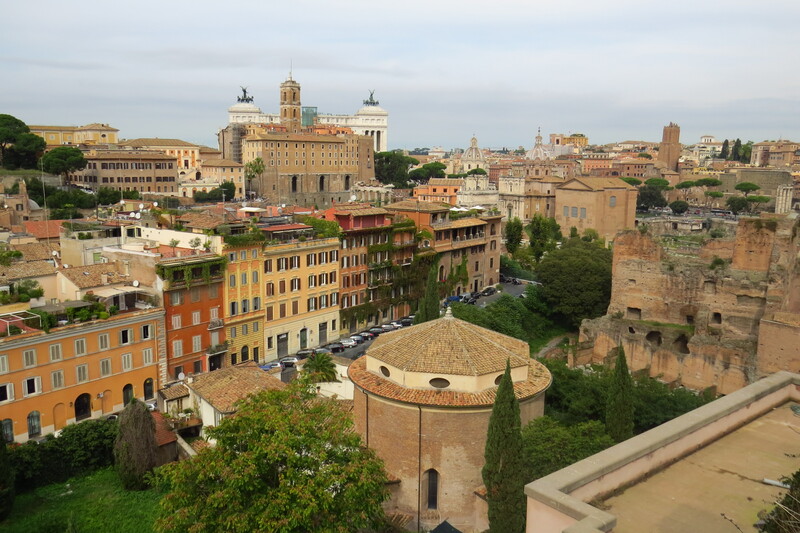 I know Rome was full of history, but actually being in the midst of all these historical structures that still existed as part of modern neighborhoods and not as isolated sites was a memorable feeling. It was notable that Rome’s subway was the grimiest and dodgiest one I’d ever taken (Toronto’s TTC subway was previously the dodgiest I’d ever taken). The trains were covered in graffiti and the platforms were slightly dark, which made me feel a little uncomfortable. Fortunately, I encountered no problems. All in all, this was a fantastic first full day in the Eternal City. 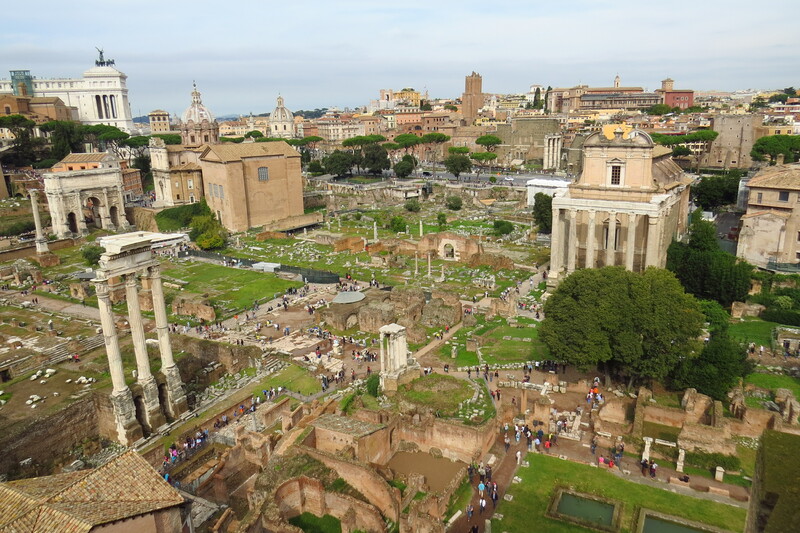 From the Palatine Hill looking over the Forum. The Colosseum is in the back next to the tower. 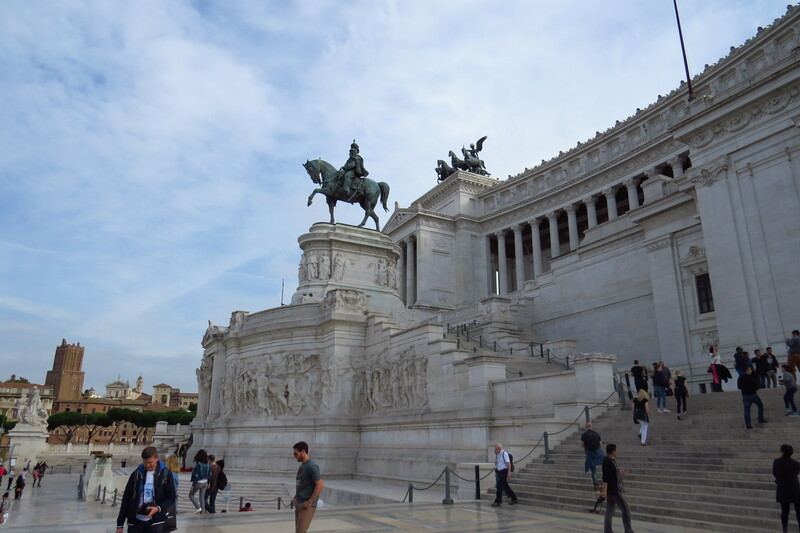 Some Romans consider this monument to Italy’s first king Vittorio Emmanuelle II a little too grandiose. 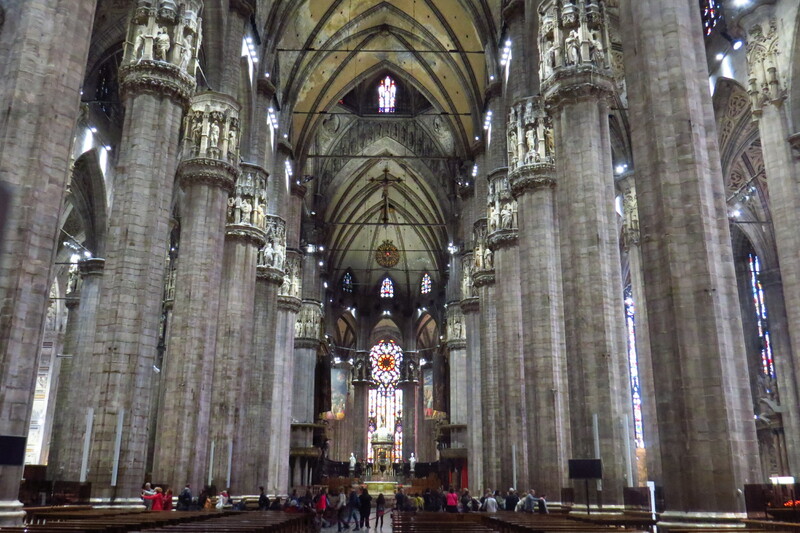 While Rome was the highlight of my visit to Italy during my Europe trip, Milan was actually my first stop. 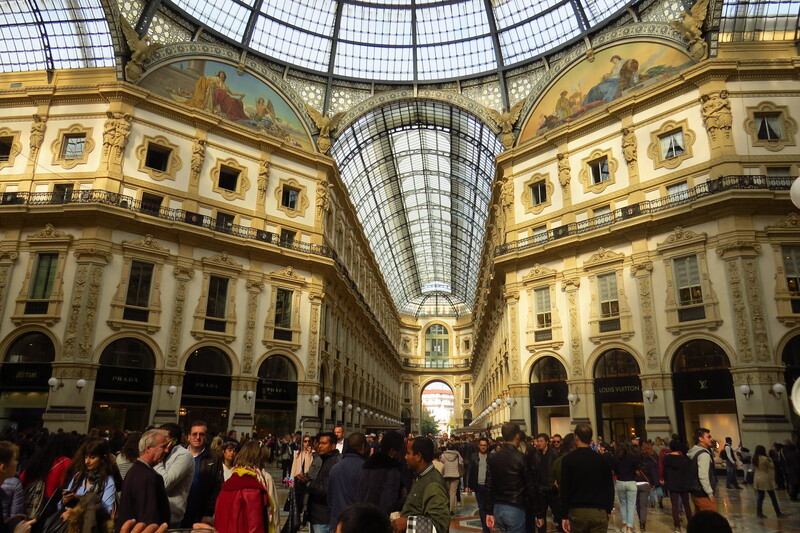 While the Italian financial and fashion center is not as well-known as the likes of Venice or Florence for travelling, I thought Milan was a fine city to visit. 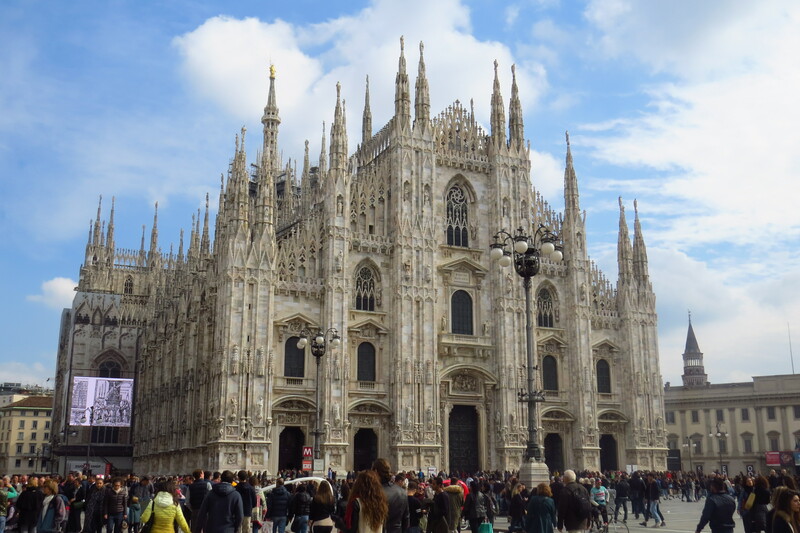 It is one of Italy’s most prosperous, being the seat of the country’s stock exchange, and modern cities, but Milan also has a very old historical heritage, said to have been founded in 600 BC by the Celts and being part of the Roman empire. However, Milan also fell under the control of the Habsburgs from the 16th to mid-19th centuries. 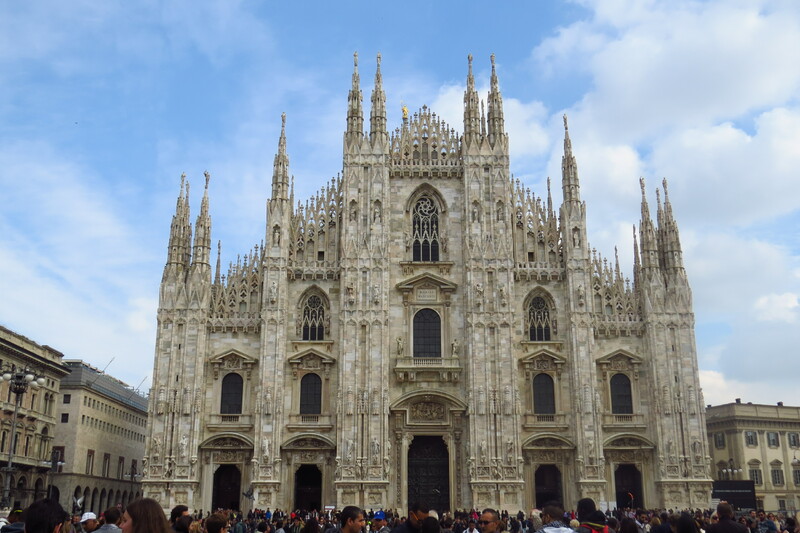 I’d chosen to visit Milan not because of finance, fashion or even football (I’m not a fan of Inter or AC Milan), but for its giant, white Duomo cathedral, plus the fact it was in Northern Italy and just a few hours from my previous stop in France. In addition, the city also had the fascinating Sforza castle, the 4th century AD-built Basilica of Sant’Ambrogio, as well as the beautiful Galleria Vittorio Emmanuelle, which is right next to the Duomo. There were also the Pinocoteca di Brera art gallery, with its many fine paintings, and a very interesting science and technology museum. When I pulled into Milan’s Porto Garibaldi station and took the subway to my hotel, I had little idea of what to expect. I was wary of the language barrier and getting around, but it turned out to be relatively easy. I actually found that there was more English in Milan than in France, such as with museums and street signs. Also my hotel turned out to be Chinese-run, so I ended up speaking Chinese to the staff. Interesting, there seems to be a small Chinese community in Milan, consisting both of immigrants and students. The Duomo was as impressive in real life as in the photos I’d seen, especially the massive interior where it felt like being in a cavern. The giant columns, stained glass windows and various statues were very attractive. I also went up to the roof where you can get a good view of the surrounding area as well as the myriad spires and other structures. The open area in front of the cathedral was packed with people, including tourists, locals as well as dodgy characters holding strings which they are said to tie on unsuspecting tourists’ wrists and force them to pay money. Next to the Duomo is the Galleria Vittorio Emmanuelle, a high-end open shopping arcade with very attractive roof and floor decorations. 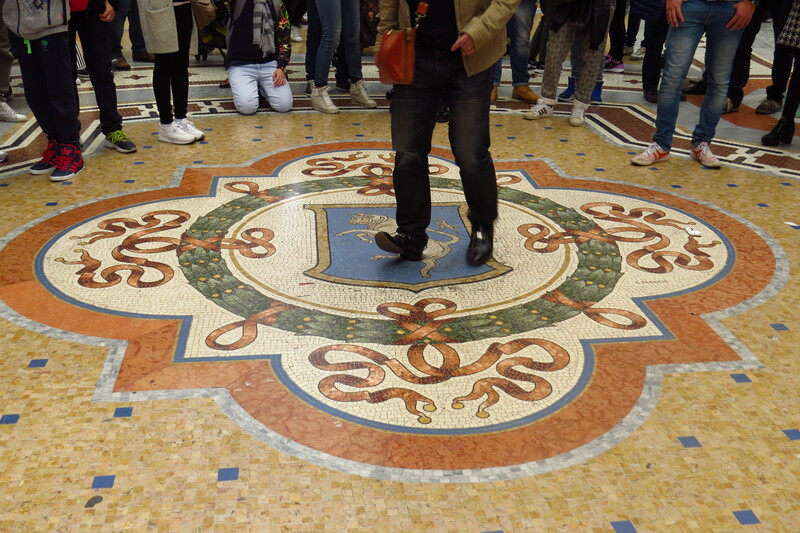 On the floor tiles in the center, there were four coat of arms, those of Rome, Florence, Turin (capitals of the Kingdom of Italy), and Milan. 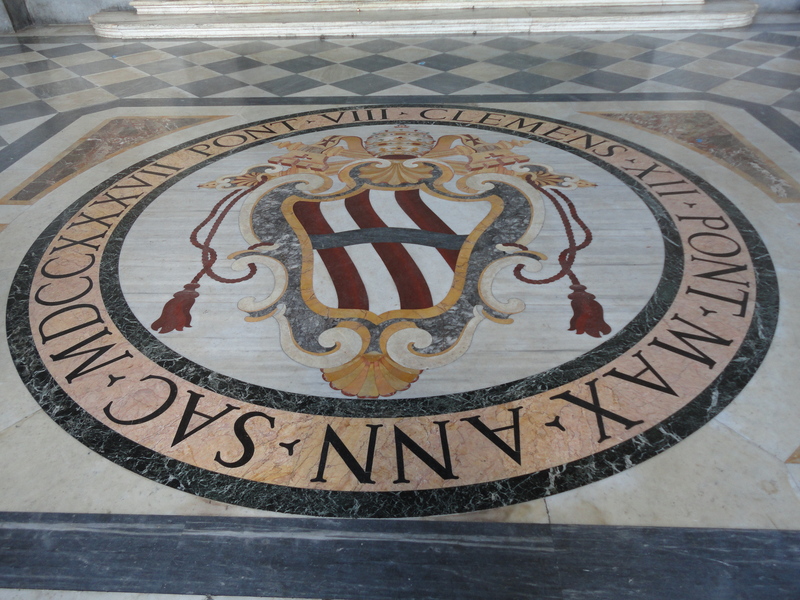 Turin’s coat of arms features a giant bull on whose testicles (yes, really) which people stand upon and spin themselves because doing so is said to bring good luck. So many people do that so that there is a hole on the spot where the bull’s testicles are. 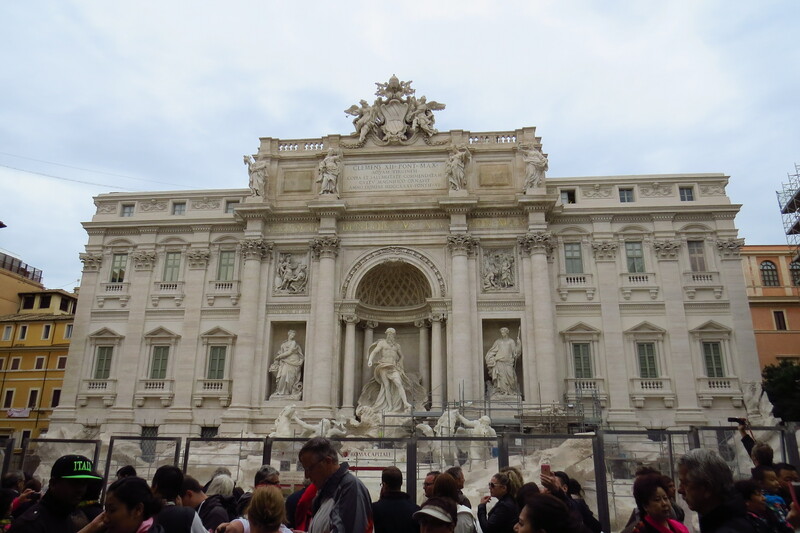 Rome is called the “Eternal City” and just a couple of days wandering around was enough to make me understand exactly why. Whether it was walking inside the largely intact 2,000-year-old Colosseum, going up the neighboring Palatine Hill, or going from the young, almost 300-year-old Spanish Steps to the Pantheon to the Castel Sant’Angelo, ancient Rome exists in an impressive and timeless state everywhere. But it wasn’t “love” at first sight when I arrived in Rome. 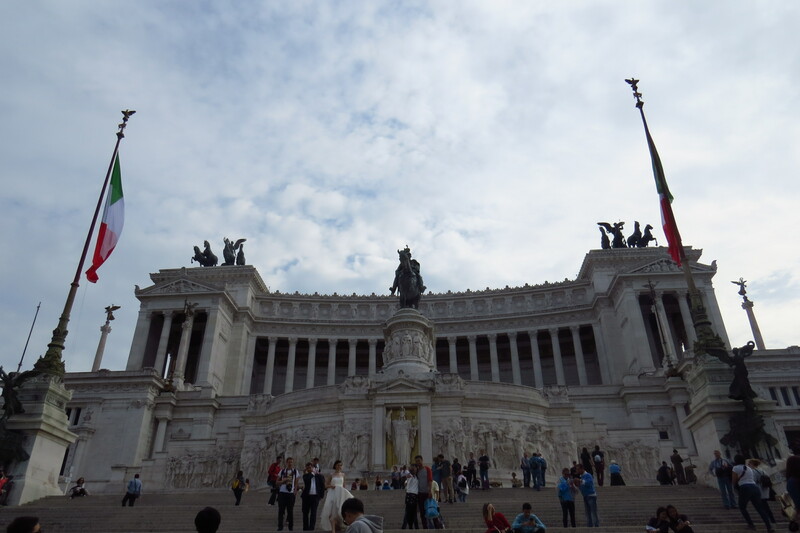 Rome actually wasn’t my first stop in Italy (it was Milan, which also was a very interesting city), but as the capital and the country’s most famous city, I’m writing about it following my previous posts on London and Paris. My initial thoughts when first stepping foot in the city was slight trepidation and dismay, the former at the notorious reputation I’d read of regarding pickpockets and thieves, and the latter at how dark and shoddy the subway was. When I got out at my subway stop and headed up the exit stairs with my luggage, imagine my shock when a guy at my side grabbed it while two of his friends walked right behind me. But when I looked at him, he said I’m just helping and true to his word, he let go when we reached the top. I don’t think I looked too helpless, especially with my slight carry-on luggage, so maybe some Italians are really helpful. And when I reached the place I was staying at, a bedroom in an lowrise apartment that was clearly only for visitors, I was taken aback at the elevator – a slim metallic cage in which the inside and the mechanism were fully visible, probably something that was older than my parents. 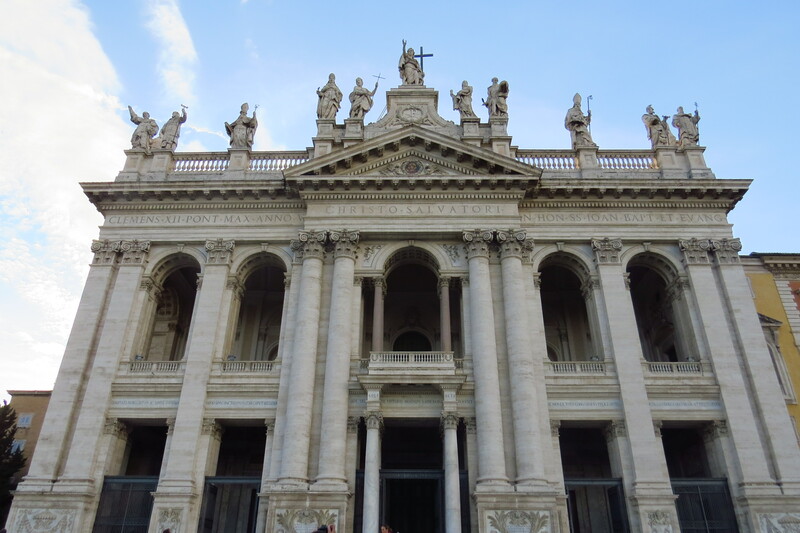 While I did visit all the great attractions listed above like the Colosseum and Pantheon, as well as the Vatican, I’ll start off with a less famous but still prestigious attraction – the Archbasilica of St John Lateran. 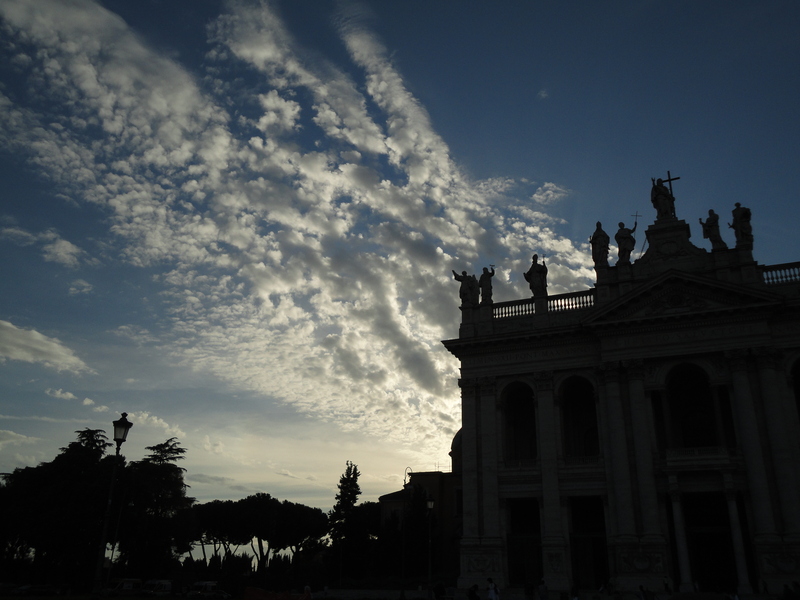 That same evening after I arrived, I headed out to the Archbasilica of St John Lateran. 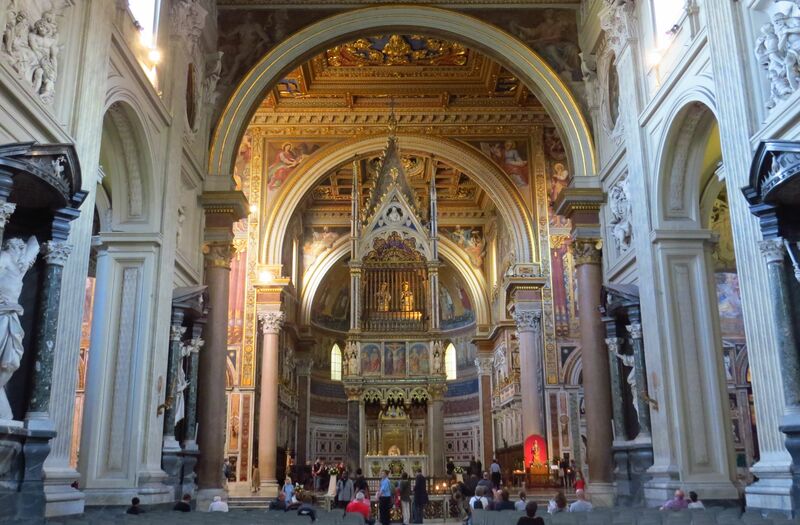 I had never heard about it until I spotted it on Googlemaps near where I was staying (just one subway stop away), but yet it is the cathedral church of Rome, and so basically the Pope’s cathedral. The archbasilica’s lofty status derived from it being the oldest church in the West, having been built in the 4th century AD, and the ecumenical mother church of the Roman Catholic faith. 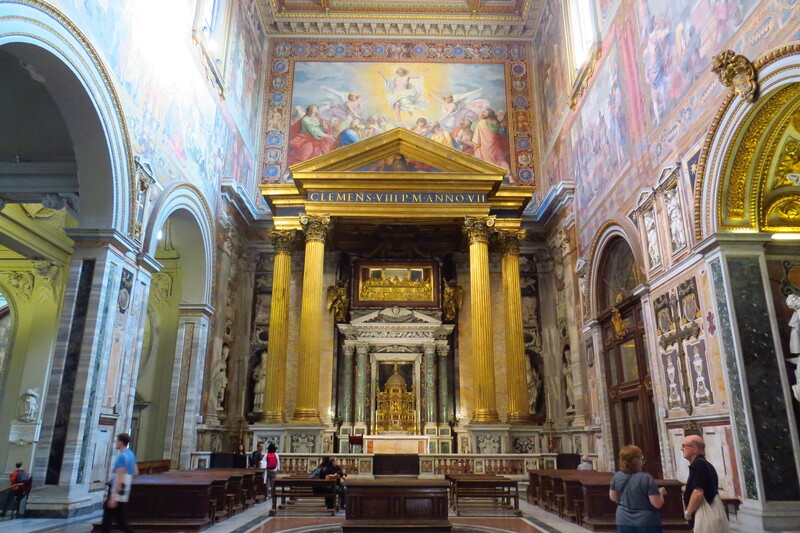 The archbasilica (the first of the four highest-ranking Catholic churches or basilicas, including the Vatican’s St Peter’s Basilica) was different from almost every church I’ve ever seen. It stood proudly on a grassy mound at the end of a driveway from the street almost as if it was a mansion on an estate. But the host of lifelike stone popes standing vigilantly on the top of its imposing stone facade made it clear it was a house of God. Inside, the vast hall featured ornate marble statues, gold engravings and resplendent painted Biblical scenes on the walls. Every altar, every hall and every cloister was richly decorated. 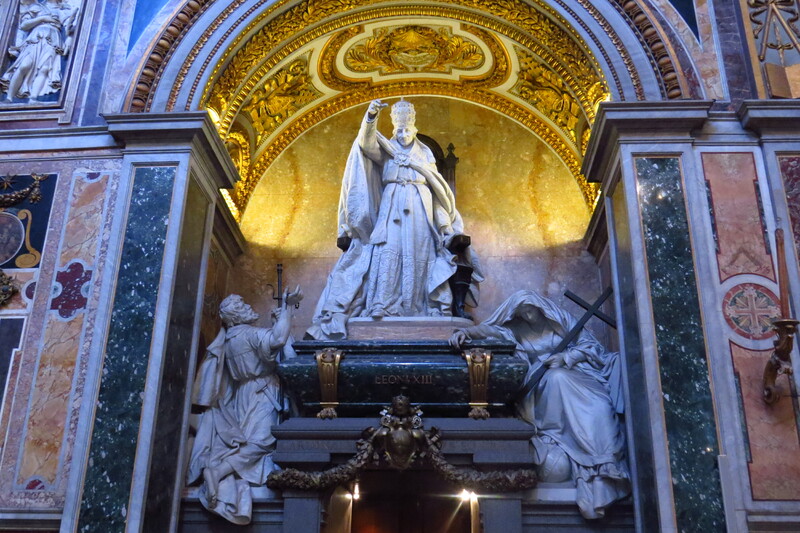 In addition, six popes are actually entombed inside the church. 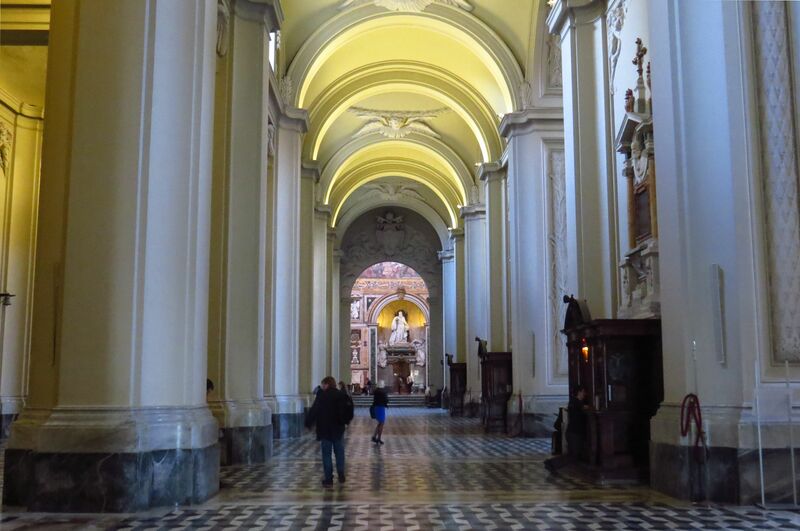 I visited a lot of cathedrals during my Europe trip – Milan Cathedral, Notre Dame, St Peter’s; but I never got tired of walking inside them, and the archbasilica was no different. When I came back out, it was fitting that there was a brilliant burst of cloud in the blue sky that looked as if it emanated from the church. Walking away from the archbasilica towards the street with the cars brought me back to the present, but the stately Roman umbrella pine trees and the stone Porta San Giovanni wall, part of the city’s 1700-year-old Aurelian Walls, that stretched across the street with arches to allow cars to go through were a steadfast reminder that this was a city where the past exists in a formidable form.